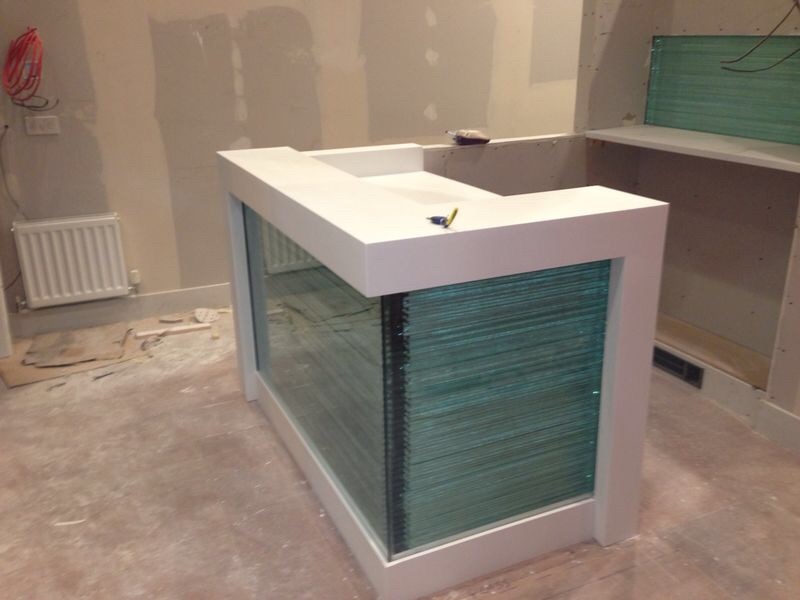 Corian and Glass reception desk, custom designed and manufactured to customer’s specifications. On a mission to find first-class quality? Then you’ve come to the right place. BESPOKE SOLID SURFACES LTD stands first and foremost for high-quality products and outstanding customer service. Browse through our website – you won’t be disappointed. BESPOKE SOLID SURFACES LTD is synonymous with first-class products. We have an extensive professional range of items, which all meet stringent manufacturing quality and safety standards. Our reputation is second to none. We always aim high, and we never miss our deadlines. Our experience in working with an extensive range of attractive, hard wearing materials means that you can be confident we can supply just about anything you want for your home, business or your own customer’s needs. We manufacture just about everything from shelves, doors and balustrades to bespoke furniture items or lighting and display units. Most products can be provided in a wide range of colours and can be further customised through engraving or etching to add your unique, personal touch. Glass Worktops, Glass Balustrades, Glass Floors, Glass Walls, Glass Doors & and even Glass Staircases! Even if it isn’t listed here, we can probably supply it. High-quality bespoke manufacturing and installation. You can count on our many years’ experience and professional working methods. BESPOKE SOLID SURFACES LTD are specialists in manufacturing high-quality, unique products. Meet our dedicated team and explore our range of reliable products and services. All products built and installed to your specification. All services carried out by our experienced tradesmen. All trades under the one roof finishing with high standards in our teamwork. We’ll be happy to discuss our high-quality work and find out exactly how we can help. Free quotation service available on site. Or pop in and visit our showroom/factory by appointment.